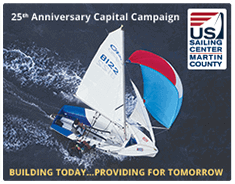 The USSCMC mission is to promote and grow the sport of sailing for all sailors, of all ages, and skill levels. We’re known for hosting annual championship regattas that serve the highest levels of sailing, yet the heartbeat of our mission is our outreach programs in the community. Join us on our mission to change lives through Sailing. Your donation matters. We are deeply grateful to every individual and partner for their unique contribution; as we simply could not fulfill our mission without your financial support. Your donation is a charitable gift and is tax-deductible to the extent provided by law. Our Federal Tax ID is 65-0377617. Please contact our office at 772-334-8085 if you have any questions. A COPY OF THE OFFICIAL REGISTRATION AND FINANCIAL INFORMATION FOR UNITED STATES SAILING CENTER, A FLORIDA-BASED NONPROFIT CORPORATION (REGISTRATION NO. CHCH49617), MAY BE OBTAINED FROM THE DIVISION OF CONSUMER SERVICES BY CALLING TOLL-FREE 1-800-HELP-FLA (435-7352) WITHIN THE STATE OR BY VISITING www.800helpfla.com REGISTRATION DOES NOT IMPLY ENDORSEMENT, APPROVAL, OR RECOMMENDATION BY THE STATE.